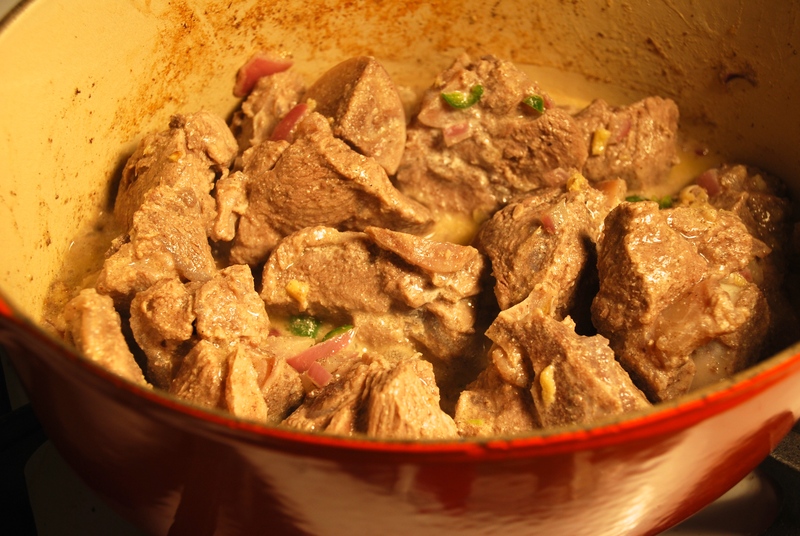 A slow cooked lamb dish, where the bulk of the work is done when you have parboiled the lamb and put it into your pot with most of the other ingredients to cook away slowly. Its pretty simple really, and makes a decent lamb curry. It is worth mentioning I did not have silver leaf or sweet ittar (a few drops give add a floral note to your dish, could be notes of rose / kewra), so left them out and added some garam masala instead at the end (around 1 tsp). Do be sure to taste the dish in the end and season with some salt if needed. Also keep in mind, that if at any point during the cooking, it looks too dry to you just add a little water to help it along, and not let anything stick to the bottom. Put the lamb in a pan of water and bring to boil. Drain and wash pieces. 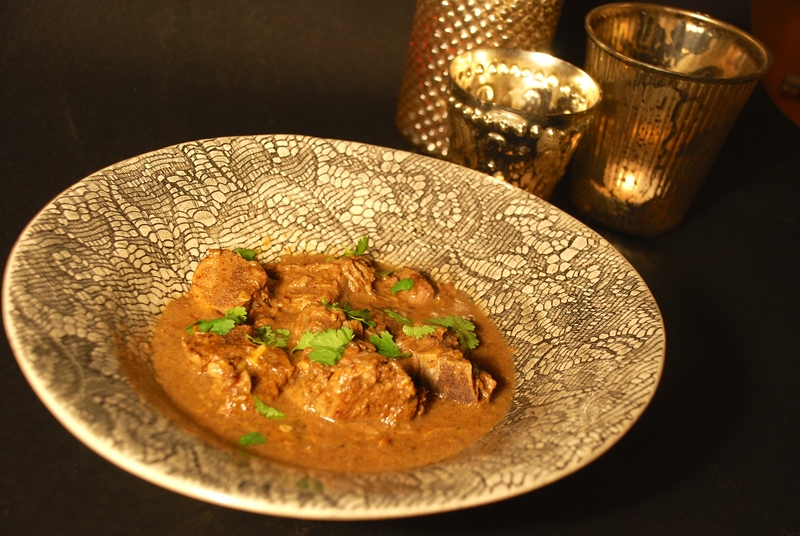 Put the blanched lamb pieces, together with chopped onions, ginger and garlic pastes, yogurt, butter, chillies, salt and half the cardamom powder in a pan and simmer. 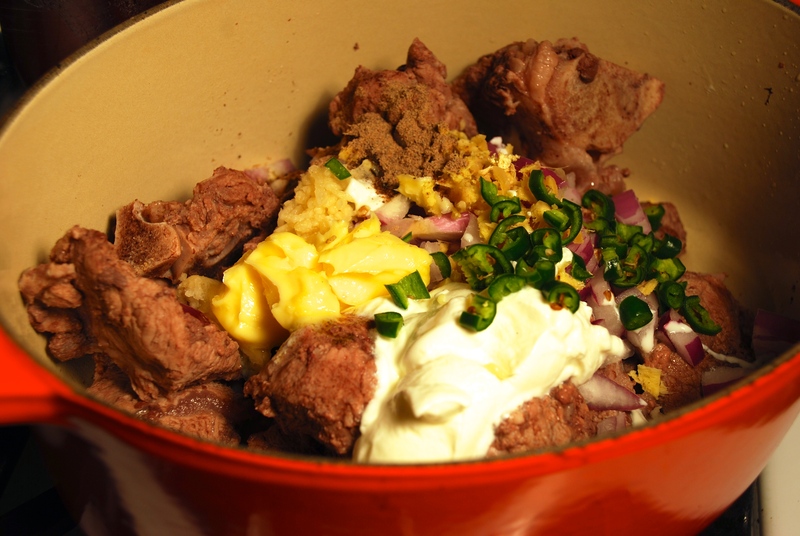 Ensure that the meat does not sear unevenly. Cook till lamb is tender. Add the almond paste and cook till the gravy thickens. Finish off by adding the rest of the cardamom powder, sweet ittar and cream. Remove to a serving dish, place silver leaf on top and sprinkle with saffron crushed in a teaspoonful of water. Serve with any roti, naan or paratha.